Every superhero blockbuster needs a Gotta See That Again action sequence. Superman Returns had the plane hurtling towards a baseball stadium. The Dark Knight had the crash’n’smash underpass chase. Even Fantastic Four had the lorry losing a shoulder-barge with Michael Chiklis. Aftering surprising everyone with cinema’s freshest, funniest new super-franchise, director Jon Favreau begins his sequel exactly where he started: a fatherless man hammering out an arc reactor in a dark hole in the Earth. 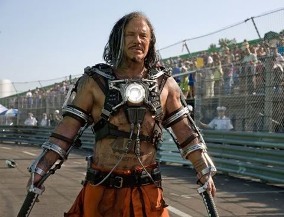 But this time, it’s Mickey Rourke’s mad Russian Ivan Vanko, who soon gatecrashes the Monaco Grand Prix to serve up Iron Man 2’s GSTA set-piece. Just the one? ‘Fraid so. His hulking body roadmapped with tattoos and strapped with a pair of devastating electro-whips, Vanko carves through F1 cars like French cheese in spectacular display of carnage. Bloodied and humiliated, Robert Downey Jr’s billionaire hero Tony Stark triumphs in their smackdown, but with his arc reactor now rotting his body, Stark rapidly loses his way – and so does Iron Man 2. With such a star-cluster cast, the worry was that Iron Man 2 would suffer Spider-Man 3 syndrome – too many stories, over-stuffed, under-told. Happily, none of the new characters outstay their welcome. We get great intros for Sam Rockwell’s oily Stark-wannabe tech-specialist Justin Hammer (battered by “Anthony” in a courtroom battle of wits) and Scarlett Johansson’s unusually limber businesswoman (battering bodyguard Favreau in a boxing ring), while Don Cheadle smoothly replaces Terrence Howard as Stark’s army friend Col Jim Rhodes (“I’m here, deal with it, let’s move on”). But for an hour or more, Favreau’s movie won’t put its money where its mouth is. Rather than powering along a action-packed storyline, screenwriter Justin Theroux’s script keeps pogo-ing between chin-wagging characters. Discussions in a donut shop with Nick Fury (Samuel L Jackson). Advice from Stark’s dead father (Mad Men’s John Slattery) on old home-movie footage. Tedious arguments – but no touching nearly-romance – with squawky Gwyneth Paltrow. Rourke’s terrific villain, meanwhile, is mostly stranded off-screen building an army of robo-soldiers for Hammer. In its most frustrating stretches, Iron Man 2 feels less like a true super-sequel than an $200m trailer for an Avengers movie (cute Captain America gag, mind) and some witty scenes (Rockwell’s gun-salesman schtick is priceless) just aren’t enough to stop the whole thing sagging in the middle. Finally, after a very silly punch-up between a drunk Iron Man and Cheadle’s hissy-fitting War Machine, followed by a frankly baffling epiphany, Stark and Favs figure out what to do: build some big robots, put AC/DC on the soundtrack and blow stuff up. Iron Man and War Machine tag-team Hammer’s droids in a noisy battle-royale that’s more chaos than choreography, but a cat-suited Johansson trumps them by taking out an army of goons with some slick gymnastic face-smashing. Maybe it’s asking too much. But where the first Iron Man was a brash surprise that pulsed with potential, Iron Man 2 never pays out quite as much as you’d hope. Even the heavy-metal showdown with Rourke fizzles as soon as it hots up. Thanks to a packed, perfect cast – Rourke, Rockwell and Johansson all ace it with Downey Jr – it’s enough to entertain. But, Gotta See That Again? To be honest, once should be enough. Russ Meyer: Porny Or Arty? Activate the Wp-cumulus plugin to see the flash tag clouds! Jonathan is a London-based journalist, critic and editor. He currently works for data visualisation agency Beyond Words.